The latest data from Kantar Worldpanel shows that there were 21 Fast Moving Consumer Goods (FMCG) companies reaching over 100 million urban Chinese households during the 52 weeks ending October 6th 2017, with P&G, Yili and Mengniu each attracting more than 150 million families. Those 3 companies reported 92.8%, 89.6% and 88.1% penetration respectively. 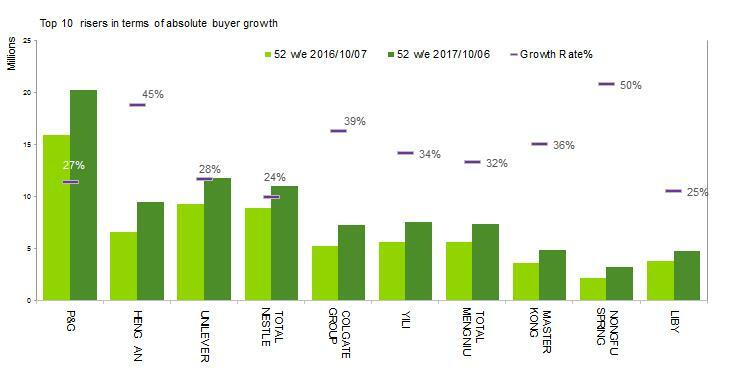 In terms of buyer growth rate, Nongfu Spring, Haitian and Yili are the top three performers. In order to be successful manufacturers will have to explore the most effective ways in which to tap into new opportunities and introduce new products that fulfil the needs and wants of Chinese consumers. Companies are increasingly required to adopt an integrated approach between offline and online world to grow new shoppers. Lower tier cities in China are benefitting from a shift of investment in infrastructure and employment. Higher birth rates and changes in lifestyle will help accelerate the pace of trading up and provide many opportunities for brand growth. Manufacturers are keen to capture this consumer spending wave with targeted marketing activities helping consumers in the lower tiers to broaden their brand repertoires. Ambrosial, the premium ambient yogurt brand under Yili, rode the category’s premiumisation wave with strong above-the line advertising and sponsorship of top-rated reality TV shows. It relied heavily on digital marketing to engage shoppers on multiple touchpoints to strengthen consumers’ consideration. The brand added 12 million new families in the lower tier cities during the 52 weeks to October 2017. Libai, another local giant, strove to build consumers’ acceptance of liquid laundry detergent in lower tier cities, with the sponsorship of popular TV programs and interaction on social media resulting in more than 3.1 million new families in the lower cities buying Libai liquid detergent products. 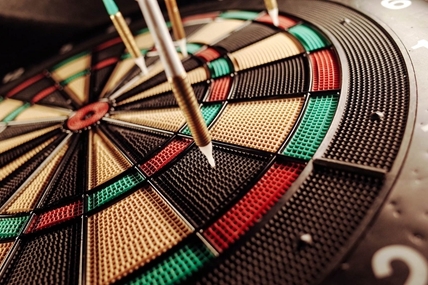 In those highly competitive categories, successful companies are creating new purchase and usage occasions resulting in better brand recognition and more buyers. Nongfu Spring managed to establish new usage occasions such as cooking and tea making for its water product which has led to an increase in demand. Kantar Worldpanel data indicated its 2 litre bottled water attracted over 2 million new families over the past year. Haitian group, China’s seasoning specialist, stayed in touch with consumers’ appetites across different regions. The company demonstrated different consumption occasions through innovative means for its soy sauce and oyster sauce products for different cuisines and inspired connections between the brand and the occasion. Over the past year, Haitian soy sauce and oyster sauce added 4.3 million and 6 million new buyers respectively. Brands in 2017 are focusing more on winning consumers at each of the critical touchpoints, empowered by insights and technology. Over the past year, more than 58% of the Chinese urban families bought FMCG from the e-commerce channel and most of them started to buy big brands through e-commerce platforms. The mainstream e-commerce players are often now chosen as the first channel for new product launches, hence becoming increasingly critical in winning trial. According to Kantar Worldpanel, P&G attracted 20 million consumers to buy its products online, well ahead of other competitors. Nongfu, Hengan and Colgate are top performers in buyer growth rate in the e-commerce channel.